Alternative capital in the insurance and reinsurance market and across the range of insurance-linked securities (ILS) products has reached new heights, hitting $75.1 billion by the end of June 2016, an increase of 10% over the last year, according to Aon Securities. The ILS market and alternative capital had grown its share of global reinsurance only slightly during the year, to almost 13% of global reinsurer capital, but the continued, steady expansion of ILS has helped the product set to become increasingly embedded in ceding companies reinsurance and retro programs. Paul Schultz, CEO of Aon Securities, stated in the firm’s latest ILS market report; “Overall alternative capital continued to grow across ILS products—reaching a new height of $75.1 billion,” as represented in the chart below. 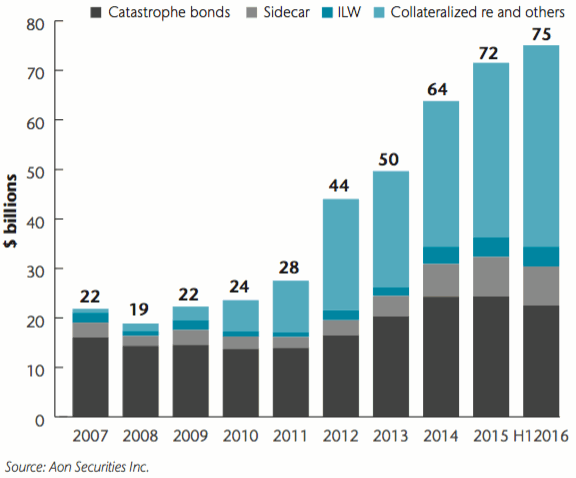 Deployment of this capital has continued to shift increasingly towards collateralized reinsurance products, with the catastrophe bond market maintaining slower momentum than in recent years. That’s likely a reflection of the state of the reinsurance market, with rates softened and competition to deploy capacity high, the ILS market has responded to this by enabling itself to play on a more level playing field by participating in reinsurance programs on a fully-collateralized basis. “Despite the slowdown in catastrophe bond issuance during the first half of 2016, investors found ways to deploy capital into the sector. This included utilizing established products, such as collateralized reinsurance and sidecars, as well as innovative ways to access risks,” Aon Securities report says. 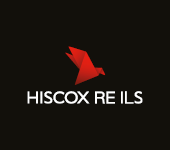 This flexibility to deploy capital into a range of products and at various points in the risk-to-capital value-chain is a key development in ILS in recent years, enabling ILS fund managers and investors to access attractive returns in a growing number of ways. One interesting fact the report reveals is that specialist catastrophe funds, the ILS fund managers, have continued to grow as the most popular way to access the ILS market, with institutional investors direct investment shrinking. That reflects the increasing need for expertise and specialisation within the ILS market, as the collateralized reinsurance market has increased its share of ILS capital institutions are making the wise decision to go with recognised professionals who can underwrite and manage portfolios of ILS assets. The increasing deployment of capital through ILS funds, channels and structures, reflects continued mainstreaming of the product into global insurance and reinsurance markets. It also reflects the commitment of investors to providing insurance risk capital. “This growing capital deployment demonstrates the commitment of the alternative markets to the reinsurance and insurance industries,” Schultz said.